A Look Back at “Summer Camp A Childhood Dream” I’ve always wanted to go to summer camp as a young girl. Today I wanted to share a story, feeling if you will, of how much I wanted to go to summer camp. A feeling maybe many of you wanted to do as a youngster but never had the chance too. Wouldn’t it be great if we could all get together and go to summer camp as adults!! When I was a young girl, I wanted to go to Summer Camp. I mean Really, Really, Bad! One summer I read the book, Laura’s Luck by Marilyn Sachs. It’s a story about a girl named Laura, who went to summer camp. Oh, how I had wanted to be Laura and have the same experiences she had had at camp. I wanted to go to summer camp and experience all that summer camp has to offer. I had a childhood friend who went to camp every summer. She went to a camp called: Camp Tekawitha. It’s a Catholic Youth Camp for Children of all Faiths and it’s located on Loon Lake in Shawano County. Camp Tekawitha has provided fun-filled, positive summer experiences to thousands of children for more than 80 years. 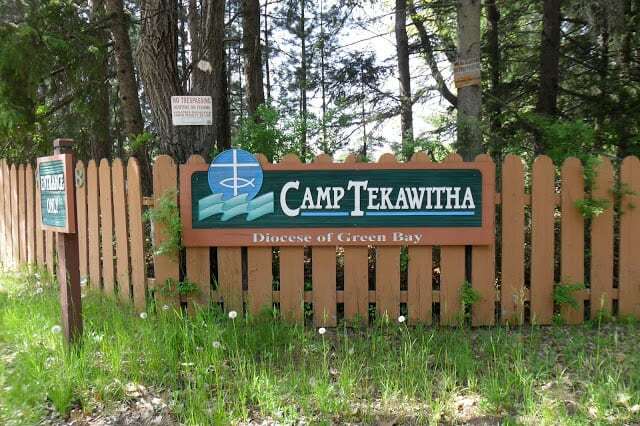 Oh, how I wanted to go to Camp Tekawitha! In my family, there were 5 girls and one boy. My parents couldn’t afford to send me to camp. There just wasn’t enough money. The answer was simply, no. No amount of hope or prayers was ever going to change that fact. I was heart broken, but I knew it was just the way it had to be. One time my mom let me ride along with my friend when her mom drove her the 2 hour drive to Camp Tekawitha. It was the first and last time I ever drove along. My mom must have sensed how heart broken I was when I arrived home. It was the one thing my mom regretted, she said to me years later, not sending me to camp. So I lived threw Laura and read and re-read the book Laura’s Luck, and I went to summer camp through her. Soon my dream of going to summer camp became a distant memory. I grew up, but deep down inside me, there was and always will be that 12 year old girl, who wants to go to summer camp:) That 12 year old girl who would sleep in a cabin, eat in a mess hall, swim in a lake, play games, make crafts and sing around a campfire. When my daughter was 11 years old, she had an opportunity to go to summer camp with her girl scout troop. I thought it would be a wonderful experience for her. Being a single mom, working full time, I knew it wasn’t going to be easy to send her to camp but I was determined to save enough money so she could go. I was so very excited for her but she on the other hand, wasn’t quite as thrilled. The night before she was to leave for summer camp, I was writing her name on her gym shoes. I could tell something was wrong, she seemed “funny”not her bubbly self. First she said she had a stomachache, then a headache. I didn’t really listen to her and figured it was the “going away from home for the first time jitters.” I was busy talking about all the “Summer Camp Fun” she was going to have. Singing around the camp fire, canoeing, making s’mores, swimming, and sleeping in a cabin. At one point, I think I even said to her, “Who knows, maybe you’ll learn how to weave a basket, won’t that be fun!” She rolled her eyes at me. The next morning we were up at 6:00 am. I reassured her that things will look better when you get on the bus and you see your friends. By 7:00 am she was on the bus and on her way to Summer Camp! As I stood there waving at her, a wave of jealousy ran through me. After all, she was going to summer camp, just like Laura from the book Laura’s Luck. Something I never had the chance to do. After a week at camp, she was finally on her way back home. I was sitting at the kitchen table waiting to hear all about her fun filled week at camp. When she walked in the back door, her face was sun-burned, she was sweaty,her clothes rumpled, her hair was a mess and her arms and legs were covered in mosquito bites and scraps. She looked like she had gotten lost in the woods for a week and walked all the way back home. I was shocked. I put a big smile on my face and said, “So, how was camp?” She dropped her duffle bag on the kitchen floor with a thump. She looked me straight in the eye and said, “Summer Camp was your dream mom, not mine.” She turned and headed down the hall to the bathroom. I could hear the shower running as I sat at the kitchen table dumbfounded! I found out months later how her week at camp went. She never asked me again to go to camp and I never asked her if she wanted to go again either. I was never big on summer camp either 🙂 Having grown in the Pacific NW I was always going camping, hiking etc so the thought of spending even more time outdoors was never something that I wanted to do!